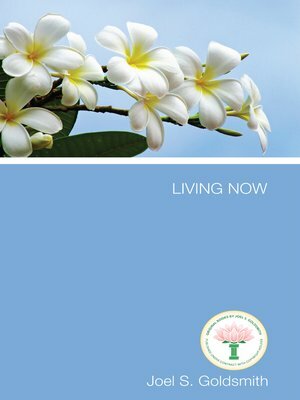 "God has no way of operating except now, as a continuing now," says Joel Goldsmith in Living Now. This book is a stirring call to forsake the past, free oneself from the chains of faith and hope in the future, and live in the Beingness of now. Goldsmith presents the truth revealed to him that at this very moment, we possess all that will unfold as our experience for all the days to come. It is embodied and embraced within our consciousness, and day by day it will unfold and appear as necessary in our human experience. "Every new minute is a continuation of this present minute," says the author, "and what we put into this minute is what is going to be a continuing experience for us throughout eternity. All that is embraced in our consciousness now will continue to unfold unto eternity because there is no future time." In Living Now, Goldsmith asks us to imagine what life could be like if we truly grasped the meaning of these challenging revelations. If we can come to the realization of our oneness with God, he says, then God's grace is my sufficiency in all things, and there is a sufficiency with which to meet my every moment's need. "Just as I receive only enough air in my lungs for this second's breath, and then a second from now I receive enough air for that second," Joel writes, "so every second of my life I receive from the Father within sufficient Grace unto that moment and unto the fulfillment of every requirement of every moment." But how do we come to that realization? By practicing and practicing and practicing, Goldsmith says, and by holding to this truth until gradually our whole consciousness changes. We ponder, meditate, and cogitate upon Reality, and we commune with our inner or spiritual Self. Then through receptivity, we become responsive to impartations from the Infinite. Ever the practical teacher, Goldsmith also identifies the barriers to this spiritual attainment – desire, fear, problems of health or supply, personal egotism, erroneous entrenched beliefs, to name a few – and shows us how to dissolve them. Eventually, he reassures us, we can begin a new pattern of living in this moment, of living each second at a time, knowing that in this second God's grace is at work.